You wrote a GOOD story, but not a GREAT one. Worse, you don’t know why. In this post, I’ll explain exactly what to look for to make your good story great. Last October, I finished the book I had been working on for over two years. After I finished, I read it, and while I thought it was ok in some parts and really good in others, there was something missing. It was GOOD but definitely not GREAT. And I had no idea why my book wasn’t working. I spent a month trying to figure it out. That month turned into two, which turned into four. I still hadn’t figured out what was wrong. Honestly, there were moments when I thought I would never figure it out. I worried the book would never be published, that the years of work would be wasted. I thought about all the readers waiting for the book, how flaky I would look when I told them that I had decided not to publish the book because it wasn’t any good. I was sinking into depression over it. My author friends couldn’t understand why I didn’t just publish it. “You’ll write another book that will be better. Just publish this and get started with your next one.” It was good advice. I knew that if I were in their shoes, I would say something similar. But even as I didn’t know how to fix the book, I couldn’t let it go either. I had a breakthrough in February when I went to the Story Grid workshop in New York City led by Shawn Coyne. He’s Steven Pressfield’s editor, the author of The Story Grid, and the creator of the Story Grid podcast. I went to the workshop skeptically—attending mostly because my friend Tim Grahl was helping to run it. I had read the book before and listened to a few podcast episodes, but I honestly wasn’t expecting to be radically transformed by the workshop. I’ve been studying writing and storytelling for over a decade. I thought I might get a few good tips, but I didn’t believe Coyne or anyone else would have that much to teach me that I hadn’t heard before. I was wrong. The workshop completely changed my writing and editing process. Since then, the Story Grid has become my go-to framework for story. I also finally knew why my good book wasn’t great. I finally understood why my story wasn’t working. My story lacked a literary crisis. You may have heard that in a good story your protagonist must make a decision. I knew this, but what I was lacking was how to set up that decision. The story crisis is the moment where your protagonist is placed into such a tight spot that he or she has to choose, and importantly, that decision carries so much weight that there is no turning back from it. In other words, a story crisis is drama. THAT is a literary crisis. And readers love this moment. Why? Because we want to know what happens next! A crisis sets up a knowledge gap, and readers become desperate to fill that gap. It’s in moments like this that readers are tempted to skip to the last page in the book just to find out if everything turns out ok (not that I’ve ever done that, of course). 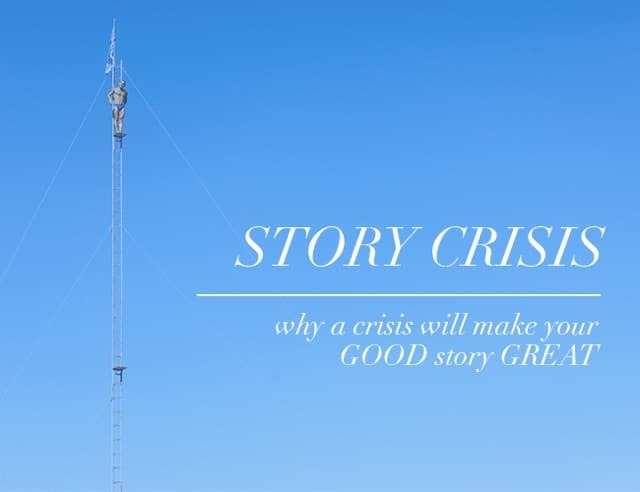 If you want to write a good story, you need to understand how to create a story crisis. Every scene must have a crisis. Every act must have a crisis. And every book must have a crisis. Crises are the foundation of your story. Crises are questions, they’re dilemmas, and since they’re happening in a character’s head, they usually occur “off screen.” In other words, they’re implied but not specified. BUT you the writer still need to know what the literary crisis is in every story you write. Crisis. The problem gets so bad that the character has no choice but to deal with it. Again, usually this happens off screen. A good example of this is the film Gravity (which is amazing, if you haven’t seen it). Sandra Bullock’s character’s problem is that everything is trying to kill her. The progressive complications get worse and worse until *spoiler alert* everyone is dead except for her. This is where many writers would stop. They would show her struggle to survive and resolve it by eventually getting to a place where she does, in fact, survive. This crisis is so important because it gives the character the chance to make a choice. Fighting for survival isn’t a choice. Who wouldn’t fight to survive? But when it becomes easier to stop fighting than it is to just die, then it leads to the crisis. The crisis is that essential moment where the character must make a choice. Best Bad Choice. The best bad choice crisis is easy to understand. Just think of that game “would you rather.” You’re given a choice between two horrible things. Which do you choose? For example, would you rather leave the love of your life at a party with another guy, or let her humiliate you as she flirts with him? See? Drama, right? Irreconcilable Goods. There is another, somewhat less stressful way to create a crisis. Irreconcilable goods are two values that don’t work together. For example, love vs. money. Both are good, but like oil and water, they don’t mix. Another example: you get into your dream college, but if you go you have to leave your high school love. Other examples: comfort vs. adventure, personal happiness vs. the happiness of others, and success vs. family. You can recognize these situations in your own life, right? We’ve all been through these crisis moments, and the choices we make in the midst of them carry outsized consequences when compared to most of the little decisions we make in our lives. The two formulas for a great crisis: Best Bad Choice or Irreconcilable Goods. In my own writing, I use these two formulas to write great scenes, but also to audit scenes, stories, and even whole books I’ve already written to make sure I’m setting up a big enough story crisis. For example, in the memoir I’m working on, I realized it wasn’t working because I didn’t have any clear crises. Things just happen. I didn’t set up clear literary crises, and therefore the choices my character was making didn’t matter. Since the book is a memoir, I couldn’t manufacture story crises, and so I had to pull them out of my actual experience. One that I discovered in the first act of my story was a Best Bad Choice story crisis. In Paris, I wanted to live the “writer’s life,” where I hung out in cafés, drank coffee and wine, soaked up the atmosphere, people-watched, and wrote my book. But when my readers gave thousands of dollars to make me take on crowdsourced adventures, I had to choose between either refunding them money and being embarrassed or giving up my comfortable, “writerly” trip for an uncomfortable (but maybe more interesting) one. I was able to take a dilemma that I was experiencing privhttps://www.youtube.com/watch?v=cU2AvkKA4kMately and turn it into a literary crisis that centered my story. Is your story risky enough? Is your protagonist making life and death decisions? Is he or she making decisions at all? How can you heighten the risk of those decisions? How can you put him or her into a best bad choice or irreconcilable goods situation? If your character is just going along with everything, your story might be good, but it will never be great. Have you ever faced a best bad choice or irreconcilable goods crisis? Tell us about it in the comments. Go back to a story or scene you’ve written and evaluate it. Is it a best bad choice or irreconcilable goods crisis? Write out the story crisis using one of the two crisis formulas (i.e. best bad choice or irreconcilable goods). Then post your crisis in the comments section for feedback. And if you post, please be sure to give feedback to at least three other writers.